In the days that followed, students continued to discuss the election. The topic came up so much that I decided to delve a little deeper. I introduced the book Grace for President (by Kelly DiPucchio), which tells the story of an elementary student who declares that she hopes to become president someday. When I pulled out the book and read the title, nobody seemed surprised. Our school has a fairly progressive (i.e., rational, reasonable, feminist) approach with respect to gender roles. Our students’ play is much less gender-stereotyped than what you’d see in most preschools. The girls play with racecars, and the boys bake strawberry pies. Recently, I had to deescalate a heated debate over who has the strongest mom. So, the idea that a girl could grow up and become president didn’t appear to rattle anyone’s foundational understanding of what boys and girls can do. But, when I read the page on which the protagonist learns that we have never had a female president, the children looked dumbfounded—jaws dropped open, and brows furrowed. I asked, “Did you know that?” Most of the children shook their heads, and the room was quiet (a rarity), almost solemn. I knew this would come as a surprise to some students, but I hadn’t anticipated what a big reaction it would cause. In that moment, I felt as though I had dropped a big dose of sexism into their lives. I felt that I should say more, but I wasn’t prepared. I said, “Isn’t that weird?” and then I finished the story. From that point on, the class rallied behind Hillary Clinton. Our school is in a big city, so it’s no surprise that our families (and therefore the students) lean toward the Democratic Party. But Bernie Sanders was still contending at this point, and the children began flatly rejecting Sanders because he was “another man”—as though they were doing their part to correct a longstanding injustice. Ever since, I have pondered how our conversations with children will change after we’ve elected a female president (as is likely to happen very soon). Sexism will still be a problem, of course, but I’ll be able to say, “It used to be we only had men as presidents.” When I say, “It’s not that way anymore,” I expect those brows will unfurrow, and those puzzled looks will change to satisfied expressions. 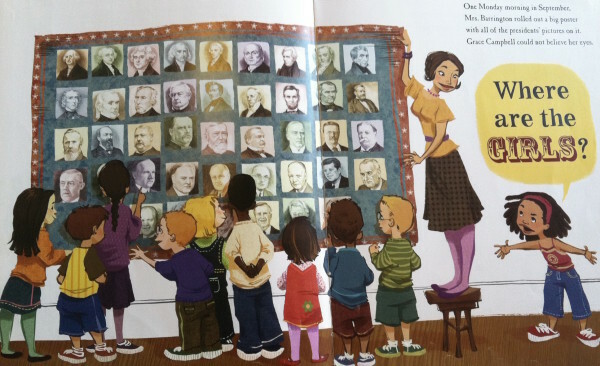 Children will recognize that we’ve reached a better, more honorable resolution to the stories we tell about our presidents.